In Friday's post, I argued that the likely pattern of human response to climate change would be characterized by very limited action until manifestly serious consequences were clear by looking out the window; then, and only then would serious action ensue. In other words, the pattern would be one of panic and repentance. Of course, some action is occurring on the fringes now: we are installing some wind turbines, we are installing some solar panels, we are making new vehicles more energy-efficient than in the past, new houses likewise. If you think back ten years to 2003, there were no usable electric cars on sale, fuel economy regulations were far more lax, there was a tenth the amount of wind power deployed, ductless minisplit heat-pumps were unknown in the US, and solar panels cost over twice as much as they do now. So in some ways we have made a lot of progress on the technology required to be carbon neutral. 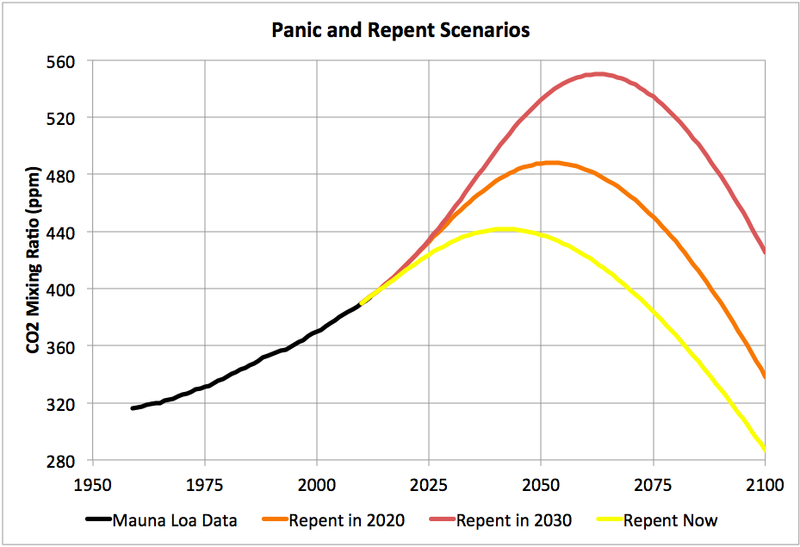 So lets define the moment that real repentance begins as that time when we start to noticeably bend the global emissions curve relative to its historical trajectory. In my scenario on Friday, I had this begin in 2020, with global emissions peaking ten years later in 2030. Then I assume emissions actually begin to fall as we deploy renewables and efficiency measures fast enough to overwhelm the growth in fossil fuel usage that would otherwise occur. Eventually, human carbon emissions become negative as we suffer the very serious consequences of the accumulated warming that is in the pipeline and start actively extracting carbon from the atmosphere in an attempt to stabilize the situation. Obviously, it makes a big difference when we start to take the situation very seriously. 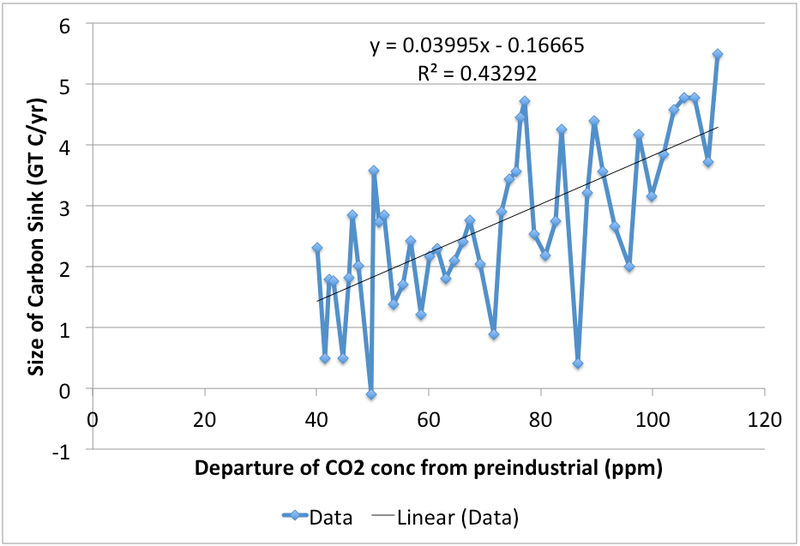 In this post, I wanted to look at the consequences for the atmospheric mixing ratio of carbon dioxide (usually expressed in parts-per-million - ppm). In pre-industrial times, but during the current interglacial (the Holocene), this was fairly stable around 280ppm (it was a lot lower during the last ice age). We have gotten it up to about 394ppm by 2012 and it continues to rise on a fairly smooth quadratic curve. So that's 114ppm above the pre-industrial level. Here, the orange curve represents Friday's scenario where we start to bend the curve in 2020 and then emissions peak in 2030. As you can see, concentration of CO2 in the atmosphere doesn't peak until after 2050, with a level around 490ppm (210ppm above pre-industrial). Given that we have already almost melted the north pole in summer with the increases so far, and gotten extreme weather raging around the world as a result, it's pretty nerve-wracking to imagine taking it up to 490ppm before it starts to come down. Given that it's fairly clear that most of the Arctic is going to be free of ice and snow in summer, and given how little scientists know about ice dynamics, you have to worry about whether that's enough to trigger an irreversible collapse of the Greenland ice sheet. My scenarios above assume that this linear relationship continues throughout the twenty-first century. There are reasons to worry about this. One is that, as the climate continues to get hotter and drier, forests could die on a large scale and cause a large release of carbon, thus reversing part of the sink. Another is that Arctic permafrost and stored methane clathrates could release large amounts of carbon as the Arctic warms up (so far, although this is definitely happening, there is not evidence of it seriously affecting the global methane curve). In short, extrapolating the linearity of the sink over the twenty-first century is quite uncertain and far from a worst case assumption. The worst-case assumption is that we trigger a runaway global warming that, once started, cannot be reversed. That probably cannot be ruled out, but, absent any evidence for it at present, I'm going to stick with the assumption of continued sink linearity. The red curve shows what happens if we wait another decade - until 2030 - to start bending the emissions curve, with emissions then peaking in 2040. Now, atmospheric CO2 doesn't peak until around 2065, at a level almost double the pre-industrial concentration. Very scary. By contrast, the yellow curve shows what happens if we start to bend the curve now and manage to constrain emissions to peak in 2020. That results in a concentration peak in 2040 at about 440ppm. Still pretty bad - we have already left it late to act. 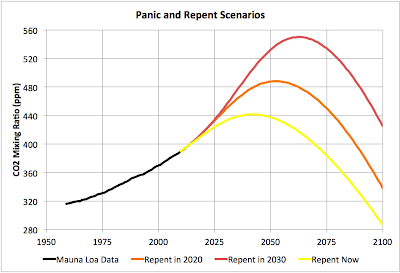 Nonetheless, I consider the yellow curve to be unrealistically optimistic - I don't see signs that the world is taking the issue seriously enough to cause an imminent reduction in the growth rate of carbon emissions this year or next. It's worth emphasizing that the exact details of these scenarios are not likely to prove accurate - how long it takes for emissions to peak after starting to reduce the growth rate, how fast we will be able to get negative, and how negative, are all uncertain. These are generally indicative rather than precisely accurate. It's also worth noting that peak temperature is likely to be decades after peak atmospheric carbon. So, from the point we start to get really serious, it will then be around fifty years until peak temperature. Dealing with this is going to be a life-long effort for all of us, and all of our children and grandchildren. The larger point is - however late we've left it to act, it's always possible to make it much worse by waiting even longer. 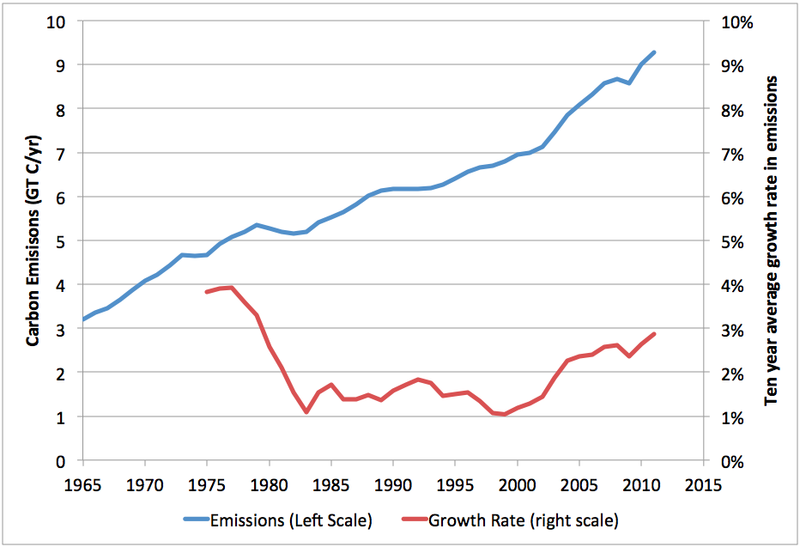 what about other greenhouse gases, and arctic feedback? since CO2 levels were at 390.9 parts per million (ppm) in 2011, and atmospheric NO2 was about 324.2 parts per billion in 2011; a back of the envelope calculation puts the contribution of NO2 to global warming at about one quarter that of CO2..
according to the EPA: "Agricultural soil management is the largest source of N2O emissions in the United States, accounting for about 68% of total U.S. N2O emissions in 2010"
atmospheric methane also hit a new high of about 1813 parts per billion (ppb) in 2011, which is 259% of the pre-industrial level, 40% of methane is emitted into the atmosphere by natural sources (e.g., wetlands) and about 60 % comes from activities like cattle breeding, rice agriculture, fossil fuel exploitation, landfills and biomass burning...it's about 20 times as potent a greenhouse gas as CO2 in the long term, but 70 times as potent over a 20 year horizen; therefore, in the short term, it's global warming effect is one-third that of CO2..
Stuart, you and readers might be interested in C-ROADS. The online simulations, C-Learn and Climate Momentum, allow anyone to run the makers' canned emissions scenarios, tweaking a few variables in the case of C-Learn. C-ROADS was used in real time during the last two rounds of climate negotiations (Copenhagen and Doha) to graphically demonstrate the effects of countries' pledges as they made them. C-Learn is not very user-friendly. The key inputs are the nine boxes at lower left, with titles "Developed", "Developing A", and "Developing B". Here's an example. Deforestation slider: set to 0.4 (we'll reduce the rate of deforestation). With these inputs, C-Learn predicts CO2 at 589 ppm, temperature rise at 2.9C, and sea level rise of about 1.1 metres by 2100. 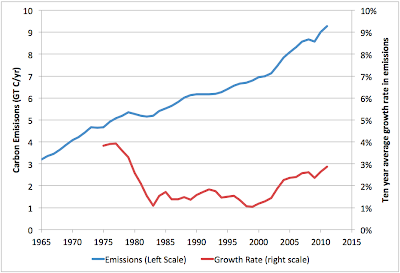 Hmm - even if you have all emissions drop by 3%/yr after 2030, concentration never drops. Their assumptions about the sink must be very different than mine - I wasn't easily able to figure out from the website what they are actually assuming. I understand that they involved some climate scientists in building C-ROADS, and validated it against the "real" climate models. So I think C-Learn is probably modelling the current understanding of physics and chemistry fairly well. That said, I found its results a little surprising too--and that was *after* I realised you had to change the "stop year" and "reduction year" inputs. But I suppose that's why we build numerical models - because the world's behaviour is too complex for intuition, even informed intuition. Having looked a little further, I think that the problem is land use emissions (from deforestation), combined with the exponential decay in fossil fuel emissions, which never quite go to zero. Total emissions remain positive over the whole period to 2100, so there is still a small positive imbalance being generated. Having one's own copy of C-Roads would be handy to test carbon sequestration scenarios. If you ask, they might give you--a well-known, numerate blogger, quoted in Mother Jones and elsewhere--a copy. Stuart; CO2 emission stays in the atmosphere for hundreds of years. They concentration accumulates year after year! 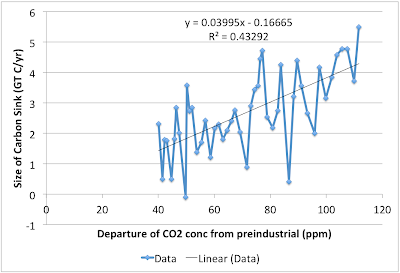 Perhaps even more important than actual )or actual peak) atmospheric CO2 concentration, is the effect of the spike in temperature on the carbon cycle. On the subject of carbon sink longevity, I have a question Early Warning readers might be able to help with. We know that water falls from the sky acidic, and comes back up out of aquifers basic, and that the difference is due mainly to subsurface mineral weathering by carbonic acid. I've been unable to find anywhere that discusses the amount of net atmospheric CO2 removed by water flows through aquifers, but my own back-of-the-envelope calculations just about matched the missing 1.4Gt/year carbon sink. Does anyone have any pointers to any serious studies attempting to quantify this sink? To me this is really less a physical sciences question and more a human nature question. Let's assume that it would take a long-term (decades if not much longer), world-wide, cohesive effort to effectively mitigate the climate situation. Let's further assume that such an effort would need to be on the order of a WWII level of activity. It seems reasonable to assume that this would require substantial sacrifice by virtually everyone. People in industrialized economies would almost certainly have to accept significantly reduced standards of living, while those in developing areas would probably have to accept that they would never achieve that same level of industrialization. I'm trying to get my head around the on-the-ground circumstances that would make these sacrifices politically acceptable, pretty much anywhere. My fear is that conditions on the ground might need to be so incredibly extreme that it might very well be too late to do much, given the delayed nature of the problem. That is, by the time we see things that are so bad that everybody agrees we have to act, there are no actions that can keep things from getting worse due to what's baked in the cake at that point. So, what people would experience would be a huge, expensive effort requiring enormous sacrifice and that would show, in political time frames, only negative results (things getting worse, not better). That is not a scenario that promotes long-term cohesion, but rather that promotes short-term, self-serving thinking and social unrest. I hope that's not the case, but I seriously worry that it may be. I have no doubt that we have the technical ability to reasonably mitigate the impacts of climate change, but I have huge doubts about our ability to effectively handle the social, political and economic challenges that would be associate with either climate change or its mitigation. As big as those technical challenges would be (and they would be enormous! ), the other challenges would be, I think, greater and more difficult to overcome. And, if we can't do the latter, the former becomes much less meaningful. Not an expert here but would like to know if these models incorporate people using less energy to heat homes due to higher temperatures and faster growth rates of the forests of Russia which would sequester more carbon? The latest WMO Bulletin, which covers changes in the major GHG's, continues to state that about 55% of anthropogenic CO2 emissions remain in the atmosphere, with the rest ending up in the oceanic and terrestrial sinks. The effect on temperature persistence of greenhouse gases other than CO2 is the subject of a nice article by Susan Solomon and others at http://www.pnas.org/content/107/43/18354.long. This article repeats the finding that the persistence of warming due to GHG emissions will be greater than 1,500 years--I remember effects past 3,000 years from another source but could be wrong. Whatever, it's effectively eternity as far as I'm concerned. Solomon and others say that the temperature rise doesn't decay as quickly as the atmospheric gas concentrations for two reasons. Firstly, "radiative forcing may not simply follow concentration because of optical depth effects (for CO2 and CH4)". Secondly, "warming may not match decreases in radiative forcing because of climate inertia, particularly due to the ocean". The model used in this paper cut anthropogenic emissions to zero in 2050, which could well correspond to panic time. By then, we'll be at of past the magic +2C temperature rise, and the effects on weather and climate will be more apparent and more serious than the are today. They won't get reduce much for over a thousand years--not a pretty picture to contemplate. "...because the world's behaviour is too complex for intuition, even informed intuition." Tell that to Albert Einstein. "But I suppose that's why we build numerical models - because the world's behaviour is too complex for intuition, even informed intuition." Maybe, but what evidence is there that numerical models are consistently any better at predicting the future than intuition. I suspect that intuition, informed by a cautionary principal, might actually provide a "safer path" through an uncertain future than will false confidence in computer modelled predictions. I don't think there's any reason to think that "People in industrialized economies would almost certainly have to accept significantly reduced standards of living, while those in developing areas would probably have to accept that they would never achieve that same level of industrialization." Eliminating fossil fuels wouldn't be particularly expensive if we could do it by attrition. Doing it in panic mode is expensive, as assets (vehicles, power plants) have to be scrapped before the end of their useful life, but once those things are done life could proceed. We might need to stop corn feeding cattle, but that's not a big sacrifice. Actually, I believe that the idea that preventing Climate Change requires enormous sacrifice is a bit of propaganda from Koch/Fox, et al, intended to prevent positive change. Nick: I don't think the idea that poverty is required to avoid climate change is just right wing propaganda - lots of lefties feel the same (because they hate the rich and corporations and climate change is a handy stick with which to beat them). I agree that a lot of "lefties" think that poverty is required. I was thinking of the misinformation that has been spread widely throughout our society, rather than about that relatively small group of lefties. Why those leftie individuals think that way is an interesting question. I'm sure your theory accounts for some. I think misguided following of "Rightie" misinformation is also a significant problem. Part of it is just a lack of imagination. A big part of it is the religiously based Apocalypse meme which has such an unconscious hold on thinking in the US. The Mayan Calendar predicts doom? Seriously? I think I wasn't quite clear: I don't think that the fact that Lefties have the same idea really rebuts the argument that the Right is trying to spread the meme in society. The idea does have independent origins, but still... Fox et al are definitely trying to make weaning ourselves off FF a scary thing.